The TOMCAR facility in Phoenix, Arizona, manufactures and services all-terrain utility vehicles for use in the mining, and oil and gas industries, in various adverse terrain and climates. Mining operations require reliable and robust vehicles that can withstand constant use in tough conditions, without the need for continual servicing. TOMCAR sets the standard for durability in brutal and oftentimes corrosive mine conditions. TOMCAR vehicles are built around a solid steel frame that holds up in the rough and rugged conditional of any above or underground mine. These vehicles come as standard with a powder-coated frame and other key components to ensure the longevity of the vehicle. The rear-engine design on the TOMCAR means that weight is held at the back, freeing up the front wheels for high-speed and agility, while keeping the rear wheels powered for crawling and climbing over rugged terrain or grades. The TOMCAR allows drivers to quickly transport materials over unreliable terrains, or simply carry workers safely and comfortably across long distances in remote areas. The utility task vehicle (UTV) has the same wheel track as passenger vehicles and other trucks commonly used at mine sites, allowing drivers to use existing tracks with ease. TOMCAR has worked in conjunction with the mining industry since 2006. Due to these partnerships it is understood there is a vast array of conditions and needs to adapt to the various mines and mining locations. TOMCAR is able to tailor its vehicles to better suit the needs of the individual mine(s) that the vehicle will be used in or around. This vehicle has four-wheel, independent suspension and pneumatic load compensators for excellent balance, as well as a differential lock that allows the 2×4 vehicle to traverse even the most difficult roads, paths, tunnels or truly travel off-road. TOMCAR vehicles are easily maintained. The fundamental components of the TOMCAR are symmetrical, which means that repairs are quicker and fewer spare parts need to be stored or carried on-board. The TOMCAR is designed for constant use and to be easily repaired on-site or in the field, using basic hand tools, with a service period of 200hr. The TOMCAR, four-wheel, power-assisted disc brake system, is easy to clean and maintain, for performance and prolonged life. Proprietary tools are included with initial fleet purchases, to ensure the maintenance shop is ready in advance. With each passing day, more and more efforts are being made to advance the safety in and around mines for the miners. TOMCAR vehicles keep the driver, passenger and vehicle safe with the fully welded high-grade steel frame, bucket seats with four-point harnesses and a safety glass windshield, making the entire cab safe and strong. The vehicle’s skid plate is one solid plate of aircraft grade steel, which protects the entire underside of the vehicle and the driver from getting damaged or caught on rocks, stumps or other object the driver may encounter. The machine has a long suspension travel and its extremely low centre of gravity reduces the risk of rolling the vehicle over. Couple this unsurpassed engineering with the durability of the frame and four-point harnesses means that, in the unlikely event of an incident, there is minimal damage or injury to the passengers and the TOMCAR. TOMCAR’s adjustable, dual-coil, hydraulic shocks allow for a smooth ride, which is much easier on the passengers and driver, resulting in less pains and aches to the miners. TOMCAR has various models that can be specifically manufactured to each mine’s needs and requirements. Each model comes with a choice of gas (1,083cc) or diesel (1,400cc) engine. The TOMCAR super tough vehicle is ideal for mining operations due to its rugged construction and driveline design. 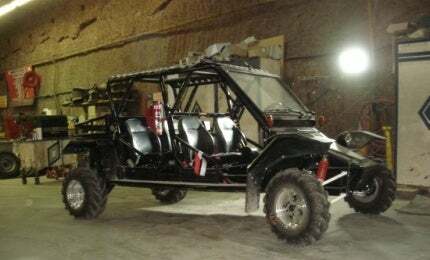 Tomcar manufactures a mining-specific vehicle model specifically designed to support mine operations. Tomcar vehicles are unique, fast and tough. From their origin as an agile and durable off-road military vehicle, they have evolved into ultra-functional, highly capable and safe machines, fit for commercial, agricultural, governmental and private use in the most demanding conditions. Tomcar vehicles are unique, fast and tough. From their origin as an agile and durable off-road military vehicle, they have evolved into ultra-functional, highly capable and safe machines fit for commercial, agricultural, governmental and private use in the most demanding conditions. Download the free brochure for more information.